As all booms do, the latest baby boom is coming to a close. Most of my friends and co-workers have had their babies, and many of these babies have already outgrown their handknit gifts, of course. But that’s how these things go ;). All total, I’ve knit 18 baby items between October 2009 and now. There’s just one more, the 19th, that I have to share with you, which is for Stephanie’s little walnut, due to arrive in a few weeks. After that, I intend to re-train all employees of GFOAB (the Grumpy Factory for Outfitting Army of Babies) to knit grown-up things. Because, frankly, I think we’ve forgotten how to do that ;). Pattern: No pattern, but I knit this sweater to Budgie dimensions, omitting the stripes, the zipper, and the contrasting cast-on. Yarn: Hand-dyed and handspun superwash merino in the Retro Kitchen colorway from Missy, A Tree Hugger’s Wife on Etsy. 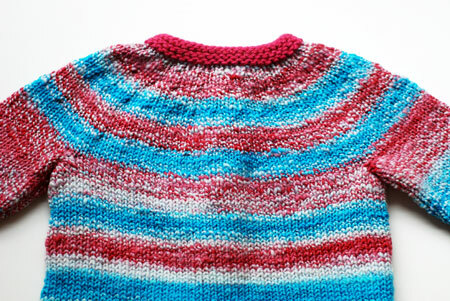 The sweater used up about 250 yards of yarn. This was a custom order that I told you about a little while back. I loved working with this squishy, soft yarn, and I love how it knit up into these beautiful wide stripes! 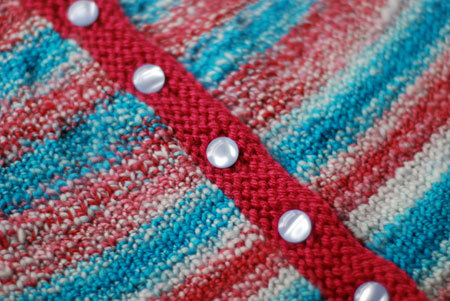 The contrast yarn is Berroco Vintage, acrylic/wool/nylon blend, in Sakura (5166). I thought these two made a good combination because they are both machine-washable. Needles and gauge: using size US 6 circs this yarn knit to about 5 stitches and 8 rows per inch after blocking. Finished dimensions: about 20″ chest circumference, 9.75″ from hem to shoulder, 7″ from cuff to armpit. This should fit up to about 3 months, just in time for little walnut to wear in the fall. The buttons are another perfect match from Windsor Button. I know they look white/clear here, but they are actually a very subtle blue when not attached to the sweater! For gifts, I always attach a care tag and an extra button. I make these tags in Illustrator (you can use any text + picture software, like Microsoft Word or Paint) and print them on heavy-weight matte photo paper. The little sheep I drew in Illustrator eons ago based on some picture, I didn’t get the actual drawing from anywhere. And that’s that! 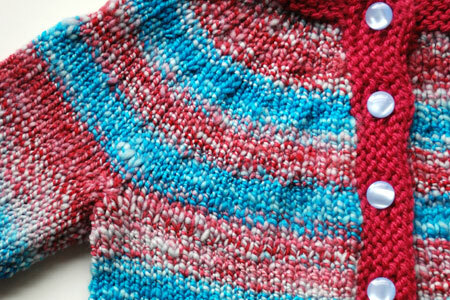 That’s the end of baby knits for now. Get ready for some socks, a shawl, a fixed-up vest, and a knitaversary contest! That’s a gorgeous sweater! Love the yarns. And the machine washability. I think my baby garment factory is about to fire up. Everybody around me is getting pregnant. Beautiful, as always. I love the tag too, such a very special gift. I like that sweater best of the BIFOs* that you have knitted. The color is just great! I just finished my first budgie, and took it to work to show a coworker. Another colleague who just adopted a 13 month old saw it and admired it… I see a toddler-sized budgie making session in my future! 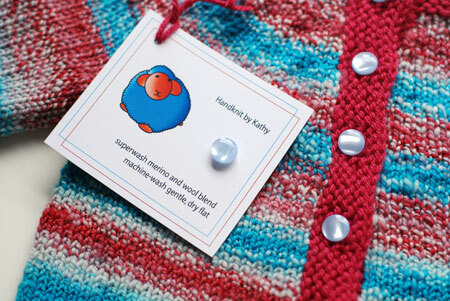 It’s a gorgeous sweater and I absolutely love the little sheep on your care tags! I have REALLY enjoyed all of your baby knits. Besides the wonderful knitting, I love the color combinations you choose. Not traditional baby colors which is totally awesome….. The sweater is adorable of course, but I also love the gift tag. What a great idea!! Thanks for sharing this. I make a ton of gifts too (though not quite 19 baby gifts in less than a year, sheesh) and I might just have to mock up my own printable tag. That’s such a sweet sweater. I just loved seeing all of your recent baby knits. You’ve got a great eye. Very Fourth of July! And, ooh, a contest? I’m normally a lurker, but had to come out of the shadows to says how fantastic this looks!…it is very fourth-of-july and looks comfy as well.Bravo! Makes me wish I knew someone that was pregnant so that I had an excuse to knit one. Very sweet. I also love your gift tags. Great idea! Just adorable. I’ve got to get working on the Budgie I have planned for my cousin’s child… before he’s a teenager! Aww, it’s so cute! It looks like a bomb pop! It has been such a pleasure to watch the parade of baby gifts you’ve been making–they are always unexpected color combinations (yayyy I get tired of pastels), interesting yarns, and so beautifully wrought. So cute! It looks like a Popcycle to me! So fresh and also patriotic!!! 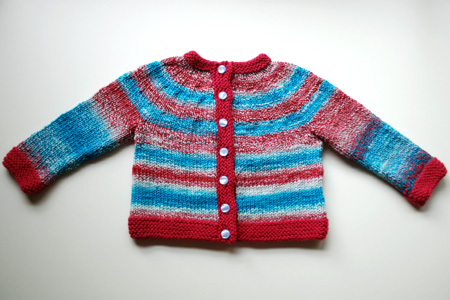 I like the fact that you used some handspun in the baby knits. People seem to have the idea that handspun is too fragile for babies but I don’t think so. The colors are wonderfully bright! Such cuteness! I think that will be a very happy baby. I’ve enjoying the baby items produced from the Grumpy Factory. The colors of this one are great! Now I know what to do with some of my smaller skeins of handspun – baby items. Very cute! I don’t have a reason to knit many baby knits, but they are usually such quick satisfying knits. Yours are exceptionally gorgeous.